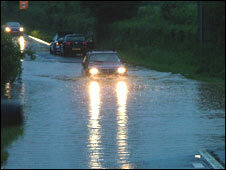 Torrential storms have led to flooding across half of Somerset. A fire service spokesman asked people only to phone 999 if there was a risk to life, as they had been inundated with calls. Motorists were being warned not to go out in their cars as many roads have been left impassable. 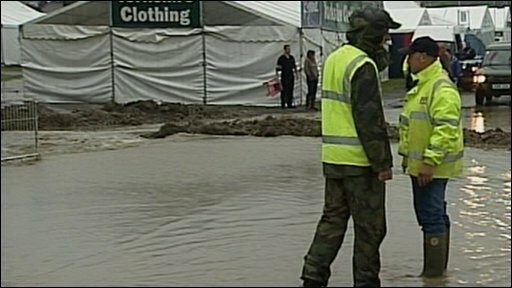 People attending the annual Bath and West show have been stuck in mud and long queues as they tried to leave the flood-hit Bath and West Showground. However organisers said they hoped the show would still go ahead on Friday, despite the poor weather. Areas in the south of the county have been particularly badly hit including Castle Cary, Ilminster, Crewkerne and the Mendips. Fire crews were carrying out salvage duties, clearing blocked drains and waiting for the Highways Agency to provide sandbags and further drain clearance. Andy Newland of the Devon and Somerset Fire and Rescue service advised people to use sandbags or fill black bags with soil to prevent water coming into their properties. However, if the situation became extreme, people would need to move upstairs, he added. An Avon and Somerset Police spokesman said the force had received a huge number of calls but the bad weather was moving up out of the area and things were calming down, although there were a number of minor road collisions and minor roads flooded. The Environment Agency said most of the flooding was surface water building up and drains proving unable to cope.